Many people know that emojis originated in Japan with Docomo. But what a lot of people don’t realize is that many of the emojis take on a much more significant meaning inside Japan. So, I thought it would be a good chance to post something lighter and showcase the unauthorized history of some of these emojis. Okay, it’s pretty obvious that this is a guy prostrating himself on the ground begging for forgiveness, which if you’ve ever seen any j-drama or Samurai flick… is basically how you say “I’m REALLY sorry” in Japan. Slightly less obvious, but this is clearly inspired from Japanese anime, that tends to be exaggerated in its emotions. It was basically made to replace these kao-mojis (T.T) (ToT). If you have ever wondered what (ToT) means… it’s a face. With two eyes, streaming tears down them. See it yet? I’ll wait… hint: the mouth is an o. Maybe you just thought this was wheat blowing in the wind, but it’s actually a type of grass that has special meaning in Japan called susuki ススキ。It’s a precursor to winter and thousands of people go out in November to find fields of this grass blowing gracefully in the wind. It’s absolutely beautiful. Aww… a building with a heart on top of it and an H. Must be a hospital, right… and the heart is for care and love shown at a hospital… right? Well, the Love part is right, but it’s not a hospital! This is a hospital: . It’s actually a Love Hotel. Or put another way… a place where you can rent rooms by the hour, usually goes to great lengths to maintain privacy of who rents the room, and has all kinds of themed rooms. But before you go too far down the path of sordid thought, you should know that although love hotels are used for various lecherous reasons, they’re also legitimately an inexpensive way for a married couple to get some time away from home for a bit. Hey, when you have doors made of paper, these kinds of businesses serve a very valid purpose. Some people stay in them on road trips with the kids as well. Just make sure you choose an appropriately themed room. Sakura. If you know anything about Japan, you’d know that Japanese people go crazy for Sakura. The delicate petals of the cherry blossom tree are a national symbol of spring on the island, but they also have been imbued with deeper meaning discussing the fragility and fleeting nature of life. The blossoms only last about a week or so, but during that week, the whole country is bathed in pink. If not from the petals themselves, it’s from the numerous sakura themed foods, sales, etc. It’s NOT just a pretty blossom. This is one of my favorite emojis. Mostly because almost nobody knows what it is or what it means. Except Japanese. Japan has a strong history in symbols and this is a great example of a symbol that has meaning only in Japan. This symbol is the mark that you must display on your car as a new driver. I don’t know the history behind the symbol, but I love that it has meaning. In North America, it varies, but usually I’ve seen “N” or “L” being used to represent new drivers. But in Japan, if someone’s green, this is what they show. Another Japanese food! It’s not ice cream. It’s three different-flavored mochi balls on a stick called dango. This variety is probably bocchan dango, and you find it everywhere in the summer. It’s a favorite at festivals all around Japan. Actually, you can find it year-round, and different areas make it differently. You could be forgiven for thinking that this was an ice cream sundae but it’s not. It’s actually kakigōri (かき氷) or essentially, shaved ice with flavored syrup on top. It’s much more popular in Japan than in North America, and I don’t think I’ve seen it in Europe. Again, it’s festival food and it was invented in Japan, so that’s why it’s included. I’m sure if America invented emojis they would have included banana splits or ice cream sundaes or milk shakes. 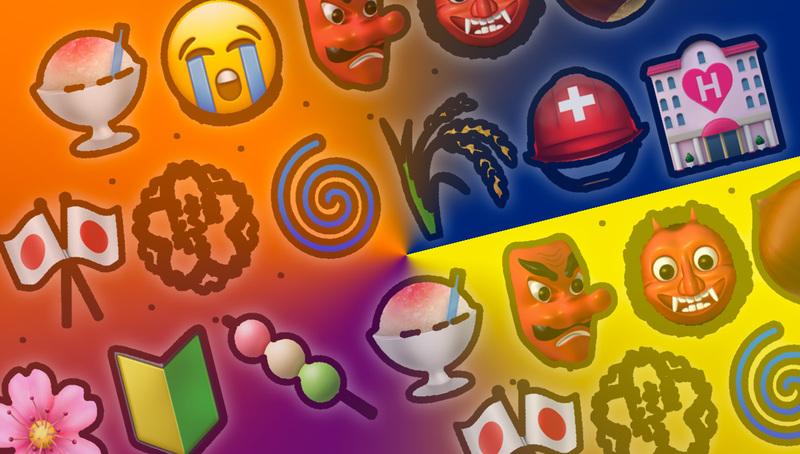 Anyway, those are just a few emojis that have their roots in Japan. Why is this important? Well, it’s not, really… but it does touch on a subject that I like a lot and that’s symbol design. Using a symbol to represent something bigger or to convey a meaning more deeply is a good part of effectively communicating, especially on the web, where the medium is fairly restrictive. Over time, things like the “diskette” icon to represent save, the radiating waves icon to symbolize wireless internet, and even the “f” of Facebook all communicate something more than their simply shapes and become part of a greater vocabulary. In addition, things like emojis are more universally understood across languages, something that is really important when communicating using only the written word.